Another Catholic bishop of England and Wales has joined the growing ranks of those who celebrate Mass in the Extraordinary Form. 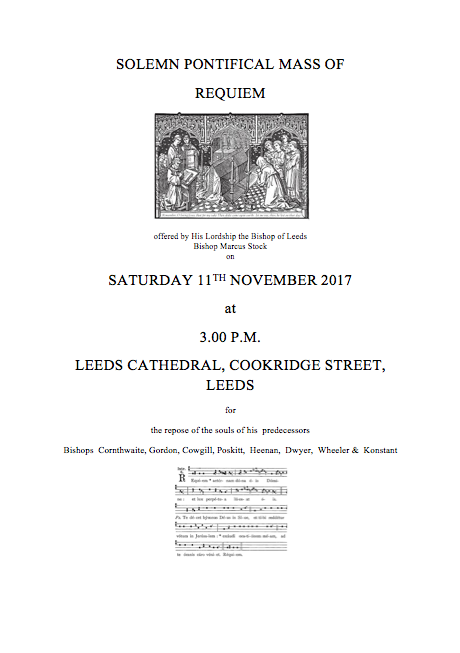 After months of tutoring by a former Anglican who is now a Catholic priest in his diocese, Bishop of Leeds Marcus Stock celebrated old rite Mass for his late predecessors last Saturday, 1 November. He told The Tablet he chose to learn the Mass in the Extraordinary Form because: "It’s important that I try to be a father to everyone in my Diocese." It was an "incredibly edifying and moving occasion" and was the first time in many years a Bishop of Leeds offered Mass according to books of 1962 in his own cathedral, the Latin Mass Society of Leeds reports. Bishop Stock was tutored over many months by Father Michael Hall, a former Anglican, who served as the Assistant Priest at the Mass. About 100 people turned out for the Mass, a requiem for previous bishops of the diocese. 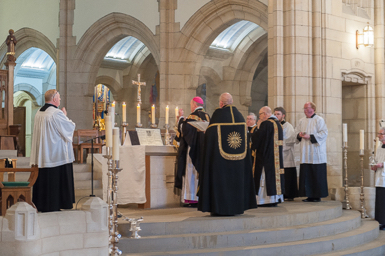 The bishop had already appointed one of the regular Sunday Masses at St Joseph’s Church in Bradford to be celebrated in the Extraordinary Form, making the church a centre for the Traditional Latin Mass in the diocese. One source who attended on Saturday found it "a truly moving and prayerful occasion". She said those who love the Old Rite were "very grateful" for the Bishop having given them St Joseph's. She also commented on the bishop’s fluency and attention to detail, commended by those who were close enough to hear. Neil Walker of the Latin Mass Society in Leeds told The Tablet: "The idea of a traditional Latin Mass in the cathedral is nothing new. When Bishop Wheeler was the incumbent – he retired in 1985 – we would have Masses then and they were usually Masses for the War dead, or for deceased members of the Latin Mass Society." He said that at one time, Leeds diocese was a rare place in the country where it was possible to attend a traditional Mass – in Killingbeck Catholic Cemetery Chapel. When Wheeler retired in 1985 – he died in 1988 aged 87 – he was succeeded by Bishop David Konstant, and then Bishop Arthur Roche. 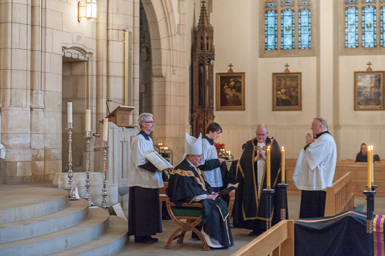 Although annual traditional Masses continued in the cathedral for the repose of Bishop Wheeler, celebrated by various priests of the diocese, no bishop had celebrated a traditional Latin Mass in the cathedral since 1970. "It is absolutely the first time since then that a bishop has offered a solemn pontifical Requiem High Mass in his cathedral. To my almost certain knowledge no other bishop in the country has offered traditional Mass in his own cathedral as a Solemn Requiem," said Walker. "Lots of other bishops have said Masses in cathedrals, especially Westminster Cathedral, but not a bishop in his own diocese," he said. "The Bishop came two years ago to one of our Masses for Bishop Wheeler. He did not celebrate but pontificated – which means he sat in his 'cathedra' or chair, and watched the Mass. He intimated to me afterwards that he would like to say this Mass himself in the future." For logistical reasons involving a choir trip, last year was not possible, so he worked towards this year. "For the last few months he has been receiving instruction. There was no problem with his ecclesiastical Latin. But the rubrics, compared to a normal pontifical Mass in the new rite, are a lot more intricate in the Tridentine Rite. The rubrics are very complex. "I spoke to the priest who tutored him. He said it flowed. There was no sense of anxiety. It was as if he had been saying it for years. I was really impressed. He managed to put everyone in the sanctuary at their ease." The Schola Gregoriana provided the music under the direction of Mike Murphy. Stephen Bullivant, director of the Benedict XVI Centre for Religion and Theology at St Mary's University, said other Bishops celebrate in the Extraordinary Form. They include Bishop of Shrewsbury Mark Davies, Archbishop of Birmingham Bernard Longley, Archbishop of Liverpool Malcolm McMahon and Bishop of East Anglia, Alan Hopes. He and his family attend a traditional Latin Mass at Holy Trinity, Hethe in Oxfordshire. He likes the time of the service – noon – and the fact that many other young families with small children attend. Some people travel an hour to get there. He noted how many surplus churches, such as the baroque church of Ss Peter, Paul and Philomena in New Brighton in the Wirral, known as the 'Dome of Home', are being given over to organisations such as the Institute of Christ the King and have become heartlands of traditional Catholic practice. "It is a bit like Hillsong and HTB," he told The Tablet. "You get this effect of committed people willing to travel somewhere." This leads to growing, dedicated parishes. "What we tend to find is young, committed Catholics in their 20s who do not have the baggage their parents' generation has about fights over the liturgy. And they are glad to go to the Latin Mass. Thanks to Benedict XVI, who in his Motu Proprio Summorum pontificum loosened restrictions on the Old Rite ten years ago, seminarians and priests no longer have to attend traditional Latin Mass almost in secret, as something frowned upon, or suspect, he added. Bullivant said it was accepted as one of the different types of Masses that people attend. Alongside folk Mass and family Mass, there are now a significant number of people who choose to attend Mass in the Extraordinary Form. Something that even a decade ago, would have been almost unimaginable. Wish to comment on this story? Join the debate on Facebook and follow on Twitter.